The Boone Central Lady Cardinals, who have ascended to the top of the Class C1 Top 10’s in the Omaha World-Herald and Lincoln Journal-Star, are going to get every team’s best shot. Boone Central took a pair of those shots this past weekend and answered with gritty Mid-State Conference victories to improve to 9-0. In a game of dramatic runs in Albion Saturday, Boone Central used a final push to defeat C1 #6 Wayne 54-48. 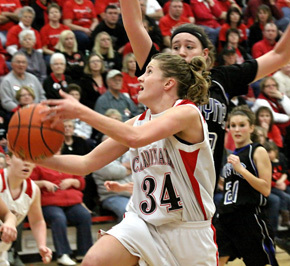 Clinging to a precarious 38-37 edge following a 17-0 Wayne run, the Cardinals got a key three-point field goal by Shannon Stuhlmiller with just over five minutes to play, then sank 9-of-17 free throws down the stretch to hold off the Blue Devils. Boone Central opened its difficult weekend Friday with a trip to O’Neill, nipping the LJS #5 Eagles 45-43. O’Neill got off to a hot start and 15-11 first-period lead before the Cardinals clamped down defensively, holding the hosts to just 14 combined points over the next two quarters. “Tonight was a typical Mid-State Conference game. Both teams defended with a lot of intensity and O’Neill shot the ball very well in the first quarter,” Kennedy said. “Our team responded well and just kept playing hard.